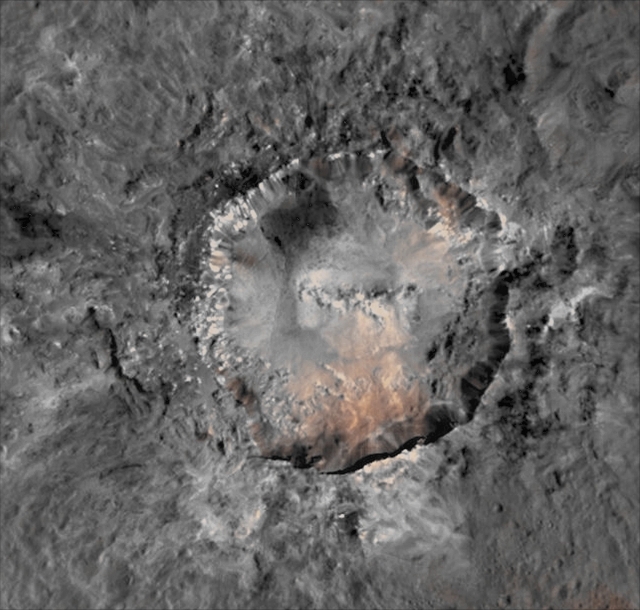 This is an Extra Detail Magnification ("EDM") obtained from yesterday's absolutely wonderful Contextual Image (or "CTX Frame", for short) of the Dwarf Planet 1-Ceres, taken by the NASA - Dawn Spacecraft, that shows us the "relatively" young Haulani Crater: an Impact Crater with a diameter of about 21 miles (such as approx. 33,79614 Km). Haulani Crater shows, among many other things (much better visible in this EDM), some clear evidence of Landslides, coming from its Inner Rim and Slopes, as well as some Smooth-looking (---> orange-yellowish colored and still unknown in origin) Material on its Southern side. Last, but certainly not least, a Central - and extremely unven - Ridge (lets us say that is, probably, "an unusually-looking Central Peak") clearly stands out near the center of its Floor. Tee white Material visible outside Haulani Crater - and, as a matter of fact, almost all around it - should be, according to Planetary Scientists, also quite fresh. We, as IPF, humbly agree on this last assumption. Just out of curiosity, please notice the also extremely uneven (we would say "broken") Outer Rim of the Crater (in particulat, watch the Southern Portion of the beforementioned Outer Rim, in between 7 and almost 9 o'clock). The NASA - Dawn Spacecraft captured the scene during its High-Altitude Mapping Orbit, from an approx. distance of 915 miles (such as about 1472,5461 Km) above the Surface of 1-Ceres. This image (which is a crop obtained from an Original NASA - Dawn Spacecraft's falsely colored and NON Map-Projected frame published on the NASA - Planetary Photojournal with the ID n. PIA 20358) has been additionally processed, extra-magnified to aid the visibility of the details, contrast enhanced and sharpened, Gamma corrected and then colorized (according to an educated guess carried out by Dr Paolo C. Fienga-LXTT-IPF) in Absolute Natural Colors (such as the colors that a normal human eye would actually perceive if someone were onboard the NASA - Dawn Spacecraft and then looked ahead, towards the Surface of 1-Ceres), by using an original technique created - and, in time, dramatically improved - by the Lunar Explorer Italia Team.